In 1925, the Exposition Internationale des Arts Décoratifs et Industriels Modernes in Paris introduced the world to the Art Deco movement. It also brought great fame to the house of Mauboussin, which won the Grand Prize for its jewelry designs. Although the company had been founded in 1827, it changed hands a few times before Georges Mauboussin took over in 1896 and began to develop the distinctive style that would garner international acclaim at the exposition. By 1929, Mauboussin had stores in London and Buenos Aires, and one set to open in New York City on October 29th. That very day, the stock market crashed. As the Great Depression cast its shadow, the U.S. branch of Mauboussin made a felicitous decision to merge with Trabert & Hoeffer, a New York-based jeweler with a keen understanding of marketing. The new firm, Trabert & Hoeffer-Mauboussin, prospered—not only by dressing celebrities and socialites in extravagant custom jewelry, but also by creating an innovative and accessible line called Reflection that epitomized the era’s Retro styles. Following the latest trends from Europe, Trabert & Hoeffer-Mauboussin produced gold components in smooth, asymmetric shapes that curled like ribbons and radiated like sunbursts. Clients would choose from these elements and select their favorite gemstones, which were then assembled to create a semicustom piece. The slogan for the collection was “Reflection—Your Personality in a Jewel.” Even though they were widely marketed, each design carried the distinctive stamp of its owner’s taste. Meanwhile, the company’s costlier jewels were being featured in Hollywood films and gaining celebrity clients like Mary Pickford, Marlene Dietrich and Paulette Goddard. 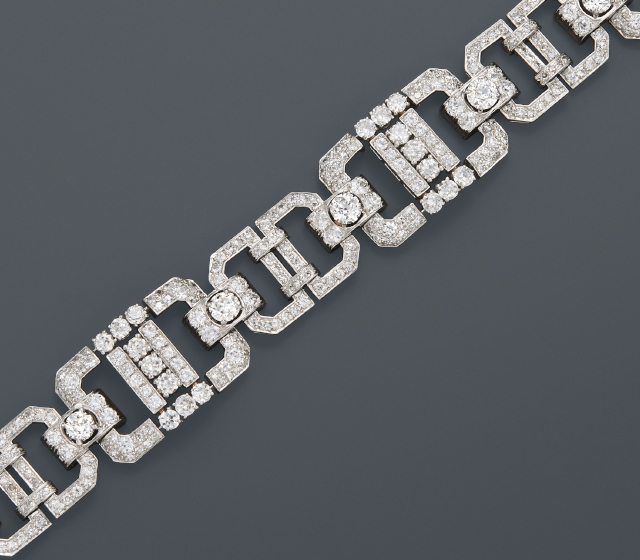 Mass appeal coupled with an elite image enabled Mauboussin to thrive throughout World War II even as many of the great jewelry houses were forced to close. The arrangement between Trabert & Hoeffer and Mauboussin ended in the 1950s, but the French division of the company, which had continued unabated throughout, remains a robust presence today.